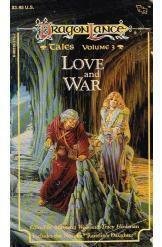 DragonLance Love and War by Margaret Weis Tracy Hickman, Sci Fi. Book is in good condition, all pages intact. The legend of Raistlin's daughter. A strange story whispered among the elves of Silvanesti, but that can not be confirmed. Told here for the first time by Caramon, Raistlin's surviving twin.